Johann Wilhelm Carstenn, entrepreneur par excellence and one of the biggest wheeler-dealers of his day,was not one to follow demand; he created it. He more than others is credited with the birth of the PrussianCadetAcademy (Preussische Hauptkadettenanstalt). This “Westpoint of the German Reich” would become Andrews Barracks during the allied occupation of Berlin following World War II. Carstenn’s role in developing the academy bears some attention if for no other reason that it reflects the serendipitous nature of history. In 1865, Carstenn, fresh from amassing a fortune by developing the villa district of Wandsbek-Marienthal in Hamburg, turned his attention to Berlin, the fastest growing city in central Europe. Carstenn purchased 4,000 acres of largely undeveloped land southwest of Berlin consisting of the Lichterfelde and Giesendorf manorial estates. Intending to repeat his lucrative Hamburg success, Carstenn set out to create a demand for fine homes in an area where no one of means wanted to live. Lichterfelde was just too far removed from the fashionable neighborhoods of Berlin. Carstenn thought potential homeowners would invest in the area if good transportation to the heart of the city were available. Accordingly, the Lichterfelde-Ost Bahnhof was opened in 1868. The expected influx of affluent residents did not materialize. Like any good entrepreneur, Carstenn turned to the government for assistance. His confederate was none other than Duke Albrecht von Roon, war minister (Kriegsminister) in the Kaiser’s government. There was already a movement afoot within the government to build a new military academy in the capital to entice Prussian fathers to send their talented but landless sons into the Kaiser’s army. From all appearances, however, the Kaiser favored a site in Charlottenburg. In 1869, on the advice of von Roon, the Kaiser visited Carstenn’s holdings in Lichterfelde. The deal would have to be sweetened to gain the Kaiser’s support. Carstenn cooperated by donating 93 acres to the government to build the academy and by establishing a grant of one million thaler to finance the construction of an administrative building. Carstenn also committed to developing the infrastructure for the district, including gas and water lines and a sewer system. Then there was the perennial question of more convenient transportation. Carstenn paid a visit to Werner Siemens at his manufacturing plant in Berlin’s Moabit district. Siemens had already devoted a lot of time and effort to solving Berlin’s growing transportation problems. Reliance on horse-drawn conveyances was no longer feasible due to increasing demands. Steam driven cars presented more problems than they solved. Siemens envisioned a city that moved on electricity. So it was in May 1881 that the world’s first electrically driven streetcar line was installed to support the budding academy in Lichterfelde. Carstenn’s investment never paid off (he lost his proverbial @##). There would be no villa district. Berlin’s affluent society never moved south. Carstenn went broke and he would never recover. The cornerstone for the new academy was laid in the presence of the Kaiser on September 1, 1873. The hour-long ceremony ended traditionally with “to the glory of youth; to the beneficence of the army,” and three raps with a hammer. The installation was constructed in red brick with a London motif––some say as a slap at Paris and the French. That would not be farfetched since the Kaiser was married to Queen Victoria’s daughter. The main entrance projected to the south off Altdorfer Strasse. Moving the main gate to Finckensteinallee would have to wait for the second round of construction. Original construction consisted of the administration building (Hauptgebäude) that also housed residential space for the top brass and two chapels––Roman Catholic and protestant. A dome was added to the administration building in a subsequent reconstruction. Topped by St. Michael with his raised sword, the dome became a landmark for Lichterfelde. It was also the object of cadet pranks. One such antic that caught the attention of the Kaiser occurred in 1911 when cadets wrapped the figure of St. Michael in bed sheets. True to the German tenet that there shall be order (Ordnung muss sein), the Kaiser directed that the culprit(s) be ferreted out and punished. The finger was pointed toward a lone cadet who was given three days detention and afterwards promoted to cadet NCO. So was leadership talent recognized and rewarded. Other buildings included barracks, a mess hall, stables, a gymnasium, shooting ranges and a military hospital at a cost of more than 9,000,000 marks. There was also a drill field that the Americans would use for sports during the allied occupation. The academy was attended by a thousand cadets who had graduated from one of several military boarding schools in Germany. Academic subjects––history, geography, mathematics, English, French, German and Latin––occupied the cadets’ mornings. Afternoons were dedicated to sports and military exercises. Professional military officers and academic professors served as faculty. In 1911, there were 72 officers and military educators and 41 civilian professors and instructors. Three clergymen and three medical doctors were also assigned. Graduates of the academy comprised a veritable Who’s Who in modern German history. Manfred von Richthofen, the Red Baron of World War I fame and Snoopy’s nemesis, was a graduate. General Field Marshal Ervin von Witzleben, remembered for his role in the plot against Hitler, was in the class of 1896. Other familiar names include Kaiser Wilhelm II (unconfirmed), President Paul von Hindenburg, Chancellor Franz von Papen and Reichsmarshal Hermann Goering. The Treaty of Versailles, stipulating that it would be closed, sounded the academy’s death knell. On March 9, 1920, many notable alumni joined remaining cadets assembled in the square facing the Finckensteinallee gate and smartly marched toward the heart of Berlin and into history. They passed through the Brandenburger Tor to the Prussian War Ministry where they presented their guidons and received final dismissal as a cadet corps. The treaty’s stipulation for closure attested to the success of the academy during its relatively brief existence. In May 1920, much of the Lichterfelde installation was designated a city-controlled high school (Gymnasium) and named the Hans Richter Oberschule. Thus the Germans would be diverted from their Prussian love for military pursuits into more mundane civil avocations––so went the reasoning. Remaining portions of the installation housed city police units. Several sources maintain that the former academy also became a hotbed for rightwing political activities. That would not be too surprising since it was hallowed ground for many of Germany’s disenfranchised elite. The school was short-lived. With the rise of Hitler, the Reich cast covetous eyes toward the old academy as an ideal locale for housing and training its own elites. By 1933, the SA/SS (Storm Trooper) element Stabswache Hermann Goering, later to become the SA Feldjäger Corps––a unit that provided many of Germany’s best paratroopers––had moved in. From these would also come the resources for Hitler’s Leibstandarte, his bodyguard unit. Historians agree that Hitler consolidated his power over the German people once and for all during the ‘Night of the Long Knives.’ Observers estimate that as many as 400 members of the SA hierarchy may have been executed by the SS as suspected members of a planned putsch. The Hitler government claimed only 70 such executions. Whatever the number, sources state that 15 of the leaders were executed in the academy compound by SS firing squads. The execution courtyard was at the corner of Finckensteinallee and Baseler Strasse. The aging installation hardly met the exacting standards of the Waffen SS. Between 1934 and 1938 all buildings on the compound were either modernized or replaced. It was during this period that two original block buildings were razed and replaced by up-to-date modern barracks. After renovation, one of these buildings housed the 280th ASA Company. A new main gate on Finckensteinallee was opened to provide access to the newly installed Strassenbahn tracks located there. Larger guardhouses flanking the gate were also constructed. Finally, the compound was greatly enlarged to the south to accommodate mechanized units. New construction reflected the modernist look of the day. The old London motif was definitely passé. Elegant Prussian buildings were modified to glorify the Nazi myth. Statuary and symbols were placed throughout the compound, and some, minus their Nazi symbols, remained there during the American occupation. Those who came and went dubbed huge statues of soldiers flanking the new front gate the Rottenführer. There is no direct English translation, so the term is variously translated, depending on one’s orientation, as: “the eternal PFCs,” “the lousy leaders” and “the imperishable privates.” Whatever their original intent, the statues remained in place during the American occupation, encased in huge concrete pillars. One is at a loss to conclude why they were not crushed along with the Nazi swastikas adorning the compound. Such are the vagaries of war and peace. The Olympic-sized pool was constructed for the 1936 games on a site where a gymnasium once stood. It is a world quality facility with a capacity of 1.2 million gallons, measuring 50 meters long by 25 meters wide and ranging from eight to 15 feet deep. It also sports a 50-meter track and a 10-meter diving platform. It exists today as a members only sport club. Leander made a number of movies in Germany, usually melodramatic musicals that glorified German womanhood. All her films were box office hits, thanks to the endorsements of Hitler and Goebels. However, entertaining the Germans was one thing while suffering their fate was another. When the allies began bombing Berlin, Leander hightailed it back to Sweden and neutrality. In March 1945, the remaining Leibstandarte troops formed ranks and marched across Berlin to the Reichs Chancellor, near the Brandenburger Tor, to prepare for the final siege of Berlin. The march was an ironic and sinister reenactment of the final march of the Prussian Cadet Corps a quarter of a century earlier. In May, having fought the Battle of Berlin, Soviet troops occupied the compound called home by Hitler’s dreaded SS. Assembled in the now historic compound that faces Finckensteinallee, General Omar Bradley took command of the American Sector of Berlin from the Soviets on July 4, 1945. 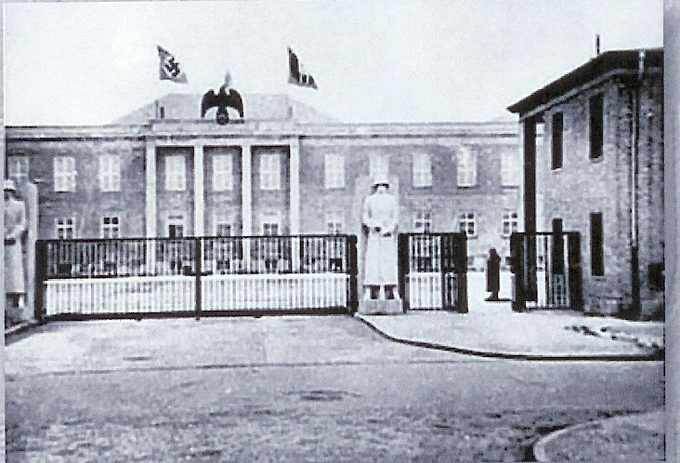 The old academy would soon be renamed Andrews Barracks. Military representatives of the four conquering powers witnessed the ceremony in the same square from which Prussian cadets and alumni had symbolically retreated 25 years earlier. Andrews Barracks will be remembered for the unique forces it housed over the years. Aside from providing a home for U.S. Army Security Forces in Berlin for four decades, it also housed the military police of Berlin Command. It was also home for the last racially segregated unit in the U.S. Army, the 7800th Infantry Platoon, a crack drill team composed entirely of African Americans. Older Berliners remember the 298th Army Band that performed at many events in the city and the 20th (later the 42nd) Engineer Company that built playgrounds throughout the American Sector. Andrews Barracks was home to both. Construction and restoration continued apace during the occupation. The chapel that still stands was erected in 1953. The old domed headquarters that housed two cadet chapels in the early days was demolished due to war damage and deterioration. The west wing of the old crew building (Mannschaftsbebäudes) was rebuilt, albeit along contemporary lines. Other buildings of the original installation, damaged beyond reclamation, were also razed. Of the original construction, only the northeast barracks adjacent to Thekla Strasse still stands. The barracks that housed Army Security Agency elements has been converted to a residential hotel. It is listed under the name of Clipper Garden Home Berlin. Information for the hotel is available on the web. If you go, the hotel is accessible from Thekla Strasse. Named for Lt. General Frank Andrews of the Army Air Corps. General Frank is regarded by many as the father of the modern U.S. Air Force, and was General Marshall’s choice for commanding the invasion of Europe. Ironically, but for the death of Andrews in a plane crash, Dwight D. Eisenhower would not have commanded D-Day and almost certainly would not have become President of the United States.